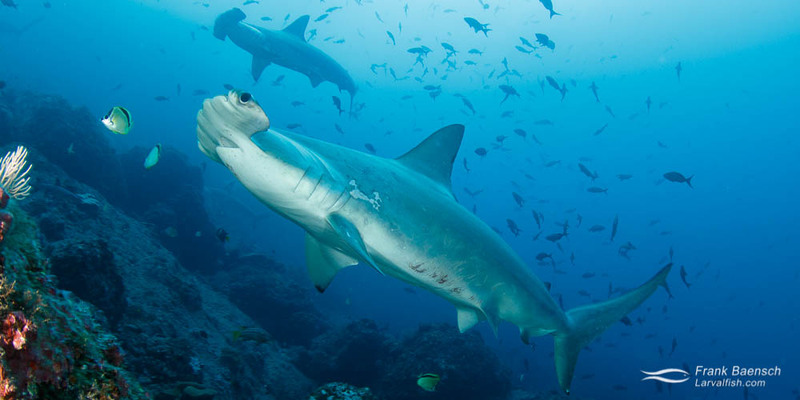 Cocos Island is mountainous rainforest paradise, remotely located 300 miles west of Costa Rica. A World Heritage Site and Costa Rica’s largest national park, the island is a biodiverse wonder that spans about 10 square miles. Close to 100 endemic plant and animal species make Cocos Island and its coastal waters their home; including three birds, two reptiles, two freshwater fish and 20 marine fish. The deep water upwelling around the island spurs an impressive diversity of marine life, that includes some 330 fish species and the largest shark populations in the world. Cocos Island is only accessible by boat – after a 36-hour journey through open ocean. Aside from live-aboard diving and a handful of park rangers, the island is untouched. Sadly, illegal shark and tuna poaching does occur regularly in the surrounding waters. Cocos Island landscape, Chatham Bay, aerial view. Cocos Island landscape, Chatham Bay, aerial view. Costa Rica. Coral bleaching occurs when coral polyps expel algae that live inside their tissues due to adverse environmental conditions, most often abnormally warm water temperatures. Not even the remote coral reefs of Cocos Island are immune to climate change. Costa Rica. Dozens of starfish cover a sand bed at Cocos Island. Costa Rica. Filming diver swims through a school of Bigeye trevally (Caranx sexfasciatus). Costa Rica. Cocos terminal male wrasse (Halichoeres dicolor) - endemic to Cocos Island. Costa Rica. Juvenile leatherbass (Dermatolepis dermatolepis). At this stage, leather bass often seek shelter among the long spines of the sea urchin, where their barred pattern serves as camouflage. Costa Rica. Cocos garden eel (Heteroconger klausewitzi). The common name is deceiving. This species is actually widespread in the Eastern Pacific region. Costa Rica. Blackfin cardinalfish (Apogon atradorsatus) are found only at Cocos Island, Malpelo Island and Galapagos usually near crevices and sea urchins. Costa Rica. Juvenile Mexican hogfish (Bodianus diplotaenia). Costa Rica. Black jack (Caranx lugubris) and whitetip reef shark (Triaenodon obesus) hunt small reef fish hiding in the coral at night. Costa Rica. Bigeye trevally (Caranx sexfasciatus) and Pacific creolefish (Paranthias colonus) schooling up close. Cocos Island. Costa Rica. Cortez chub (Kyphosus elegans) and Pacific red snapper (Lutjanus peru) feeding at the surface. Cocos Island. Motion blur of Cortez chub (Kyphosus elegans) and Pacific red snapper (Lutjanus peru) feeding at the surface. Cocos Island. Cocos serranus (Serranus tico), a Cocos Island endemic. Costa Rica. Two orange commerson's frogfish (Antennarius commerson) at Cocos Island. Costa Rica. School of leather bass (Dermatolepis dermatolepis) at Cocos Island. Costa Rica. Schooling mullet snapper (Lutjanus aratus). Costa Rica. Leather bass (Dermatolepis dermatolepis) sub-adult phase. Costa Rica. School of bigeye trevally (Caranx sexfasciatus). Cocos Island. Costa Rica. School of yellowtail surgeonfish (Prionurus punctatus). Cocos Island. Costa Rica. Marbled ray (Taeniura meyeni) and whitetip reef shark (Triaenodon obesus) at night. Costa Rica. Flying brown booby under white sky. Costa Rica. Red-footed boobys. Cocos Island. Costa Rica. Two red-footed boobys. Cocos Island. Costa Rica.